According to the ING International Survey Mobile Banking 2018 research, around 64% of the respondents heard of crypto currency. Somebody says the hype is gone; somebody is still looking for ways to generate profit. There are many options to choose from, but one of the most popular is mining with its simplified version of “cloud mining”. It’s quite difficult to set up a miner in your own apartment. Even a single S9 ASIC miner would heat it up so much that you would have to turn off the heat in the winter. Hooking up, say, 3-5 to miners would require over 5kW capacity, but a typical two-bedroom apartment doesn’t even get that much at the outlet. In addition, the noise level would be so high that staying in the apartment would become unbearable. To assemble a card-based farm, you have to have certain skills in assembling and setting up hardware. The most common option is a farm made of six GTX1080 graphics cards. And prices for those graphics cards can vary significantly, from 550 to 1100 Euros. You would have to constantly monitor that kind of farm, worrying about keeping it cool and free of dust. If you don’t understand what cloud mining is, let’s put it simple. Basically, you rent out a computing power from a mining website that has mining farm somewhere in Europe or Asia. This way you save money on expensive hardware and on rent of some place to store that equipment. Besides, you avoid all the electricity expenses and problems with cooling the hardware. With cloud mining, you just pay for GH/s or TH/s to get the computing power to be able to mine crypto currency. And here is the big choice you need to make – simplicity, security and money. An ordinary user wants to have simple registration, user-friendly admin panel and decent price for the services. But don’t forget about the risks of power disruptions due to few data centers, or the risk of losing your crypto currency. Hashtoro.com placed its hardware in several European data centers in countries loyal to the crypto industry to diversify the risks. Currently, the total capacity of the data centers is 35 MW, enabling them to place 25000 Bitmain Antminer S9 or 40000 Bitmain Antminer L3 +. Hashtoro.com is very serious about the security of cloud mining with its data centers; therefore, the exact location of mining farms is not disclosed. How to choose the best Cloud Mining site to start? There are many sites to choose from with relatively long history and relatively well-diversified data centers for cloud mining across the globe. And the more currencies for cloud mining it offers, the longer the contract and the higher is the entry threshold. The entry price for cloud mining may range significantly. For example, Hashtoro price for 10 TH/s is 400 Euros, while Genesis Mining price for 10 TH/s is 2,800 Euros. It means for $6000, you can purchase an annual contract for 100TH. Given the current network complexity, you can recoup your investment within one year. You will have mined 1.71 Bitcoin. And if its price rises, the user will receive additional revenue from that growth, as happened in 2017. Once you compared the services and chose the one you need, you need to get to the website, and register your account. Usually it doesn’t take much time. For example, Hashtoro.com requires only e-mail and password for registration. You enter the real e-mail address and verify the registration by the confirmation link that is sent to your mailbox. The company site offers three types of mining packages: Bitcoin Cloud mining, Litecoin Cloud mining, and Ethereum Cloud mining. The service mines all three cryptocurrencies (LTC, BTC, and Ethereum), in equal proportions, to spread out our risk. For example, early in the year it was very profitable to mine Ethereum and Litecoin, but when their prices fell, it became more lucrative to mine Bitcoin. The system determines which currency is most profitable to mine at the current moment and dynamically switches to mine that particular currency. At the end of the day, the currency is exchanged for the one the client chose to mine. Tests have shown that this allows the client to generate up to 10% more profit. Capacity increases every two weeks by 5–15 percent. As soon as the company receives payment for your order, your contract will be added to your account, and you will be able to start crypto currency mining immediately. Depending on the type of your contract, you can directly mine bitcoins, DASH, LTC, Zcash or Ethereum. You can start on the platform from 20 Euros that is the minimum available plan. The company buys up Bitmain equipment and spins it up. That gives it a hashrate increase of 10-20%. In conclusion, keep in mind that another boom in Bitcoin’s price may significantly increase your profit and decrease payback period. The company was founded in May 2018. Hashtoro.com is a cloud mining cryptocurrency service. It offers a safe and simple way to get computing power to start cloud mining bitcoin, litecoin and ethereum. 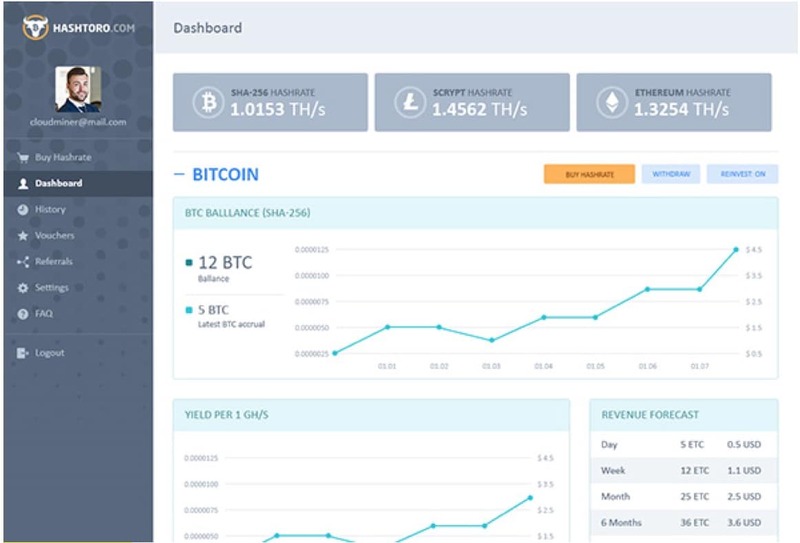 The company provides cryptocurrency solutions for both everyday users and business entities. Hashtoro is suitable whether you want to get into mining on a low budget or diversify your current portfolio. The company’s data centers are set up in Finland and Norway. Countries, favorable to the crypto industry. Primary competitor’s advantage is that the company offers low budget cloud mining opportunities. The cheapest cloud-mining contract will cost just 20€. Hashtoro’s infrastructure is powered exclusively by renewable energy. The hot air generated by mining is directed into heat pumps, while the hot water is pumped into the adjacent heating systems. This is why hashtoro.com has become one of the most profitable and safe cloud mining services.